The IR101 NP1 Serial Decoder is a low-cost, easy-to-use electronic device that directly decodes the NP1 infrared remote control protocol. The output produced by the IR101 is selectable for either single-byte binary or for strings in ASCII/hex. No external clock, oscillator, crystal, resonator or other timing or support circuitry are required. Every effort has been made to ensure that the IR101 is easy to integrate into any design with an absolute minimum of support circuitry. Only a 3-5VDC supply and an inexpensive IR receiver module are necessary for complete device operation. BD 4 Input High-true Baud Rate Select This input determines the operating baud rage of the IR101 device. A high level applied to this input selects 9600 baud. A low level selects 2400 baud. This input accepts the standard demodulated output from virutally any IR receiver module. The polarity of the input is determined automatically. MD 2 Input High-true Output Mode Select This input determines the type of output data. A high level applied to this input selects single-byte binary output. A low level selects a five-byte ASCII/Hex string. RXD 6 Input Automatic Serial Input This input is used for optional serial commands from a host processor or microcontroller. If not used as a serial input, this becomes the serial output polarity selector. Whatever logic level is applied to this input becomes the polarity of a logic 1 for the serial output. High-true LED Driver This output can directly drive an LED or other indicator requiring up to 20mA. High-true output is provided to ease interfacing to power transistors in many applications. Automatic Serial Output This output provides TTL-level, RS232 serial data in NRZI format with 8 databits, no parity and 1 stop bits. Data rates of 2400 and 9600 baud are supported. Output polarity is determined automatically. The IR101 device begins it power-up sequencing and autoconfiguration as soon as power is supplied. The BD and MD inputs are sampled and the output mode is set up accordingly. The IR101 monitors IRIN and RXD to automatically configure the IRIN and TXD polarities, repectively. Power-up is complete within 700ms. The IR101 receives NP1 serial data strings and provides the command (key) codes to the host via a standard serial interface. In detail, once the serial string is received, it is sum-checked and decoded. If the device ID coded matches that of the IR101, the command code is output to the host. Only properly-formed, error-free strings will produce output from the IR101. The IR101 will assert the LED output signaling that a valid IR string has been decoded. It will remain asserted for approximately 150ms after the end of the last properly decoded NP1 string. During repeat sequences the LED output will be asserted continuously as the NP1 protocol specifies a repeat period of 100ms, ±10ms, which is less than the LED assertion period. Data from the IR101 is output as a single, binary byte reprenting the 8-bit command code received. Just like RS232 serial data, the byte is output LSb-first with one start bit, one stop bit and no parity. This mode is ideal for direct microcontroller interfacing. Data from the IR101 is output as a 5-byte, 8-bit clean ASCII string. The string is comprised of a start byte "$", 2 ASCII/hex digits representing the command code and is terminated with a carriage return and linefeed (CRLF). For example, an IR command of "AB" would cause this string to be output: $AB<CR><LF>. 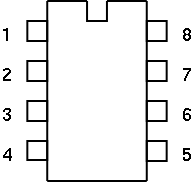 Just like RS232 serial data, each byte is output LSb-first with one start bit, one stop bit and no parity. This mode is idea for environments where higher-level serial protocols are in place and binary data could be misinterpreted as control characters. IR101 configuration is set with three signals: BD, MD and RXD. BD and MD set the baud rate and output modes, repectively. The RXD input can either be connected to a host serial output to force automatic output polarity selection or forced high or low, specifically. Whatever level is sensed on RXD during power-up becomes the level associated with a logical 1 for both the RXD and TXD signals. RXD is continuously sampled for conditions that indicate a change in signal polarity. If RXD is negated (set to logic 0 as in a start bit) for longer than 25ms, the polarity of both RXD and TXD are inverted. Anytime the previous circumstance is encountered the signal polarity will be adjusted. This function is inplace to allow for slow peripheral start-up and/or (re)configuration at run time. The polarity of the IRIN signal autoselects its polarity. This is done at power-up and during normal operation. If IRIN is asserted continuously for more than 25ms, an error is sensed and the polarity of IRIN is inverted. This reconfiguration will occur anytime the previous circumstance is encountered. This function is inplace to allow for slow peripheral start-up and/or (re)configuration at run time. Should the RXD signal be connected to a host serial output, the IR101 can receive commands that produce addtional output to the host. There are two possible commands. The first is "A" (0x41). It echos a "B" (0x42) back to the host. This command is useful in applications where higher-level protocols are in place and is used to determine the presense of the IR101. The second command is "V" (0x56). This command echos a version string back to the host. The version string is comprised of a manufacturer identifier, a protocol identifer, a device version number and the system (or customer) ID code the IR101 is set to receive. For example: "IRS NP1 V1.1 ID=0101". This string is followed by a carriage return and linefeed. Should these functions not be needed, RXD should be forced to the level that indicates a logical 1 for the TXD signal. Copyright © 2003 Infrared Remote Solutions, Inc.